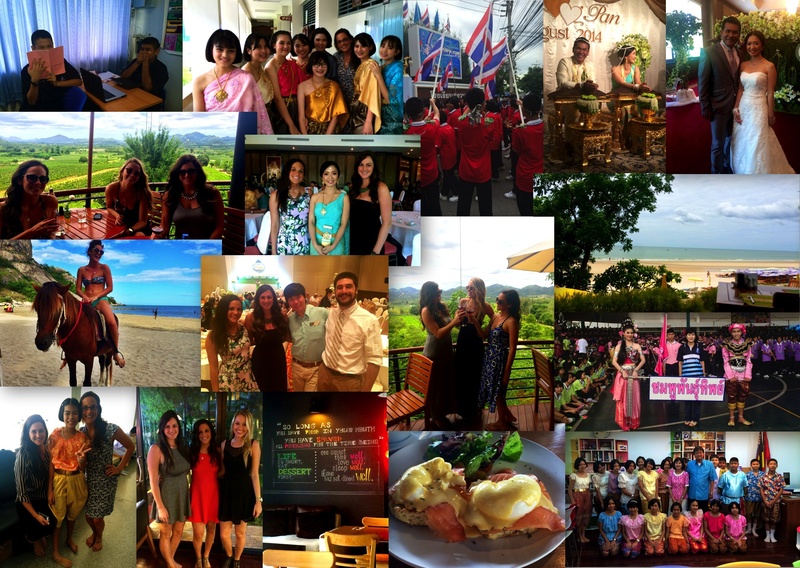 August has been full of experiences rich in culture, calories and camaraderie. Isn’t that what life is all about? I continue to laugh, eat and dance my way through life. As my yearlong experience comes to an end, I have a heightened awareness of my surroundings and a greater appreciation for my parallel universe. The term “parallel universe” is defined through a wide variety of scientific definitions, philosophical terms, music, literature and films. I gained a particular affinity for the term after watching the film, The Beach(2000) starring Leonardo DiCaprio. I saw this film before I moved to Thailand but have re-watched it several times since moving here. Despite the mediocre reviews, the film does an uncanny job at describing what it feels like to transport yourself into a whole new world. It is terrifying at first, but you quickly make new friends, make different routines, decipher your role in your new reality and find that your life begins again; a parallel universe. Life continues on without you back at home. Friends and family text, call, Facetime, and stay connected through social media outlets but no one can understand the parallel universe of living in a third world country without having experienced it themselves. It reminds you how vulnerable and insignificant we are as human beings but it also reminds you how valuable each and every day is. Ultimately, our memories of reality and the impact that we leave on others is the only way that our universe continues to exist long after we leave the physical place behind. In today’s society it is so easy to become distracted from what is in front of us. We always have a way out of uncomfortable situations. If we feel lonely we can text our friends, if we’re bored we can browse social media and if we want to laugh we can go on Youtube binges. I have made a personal promise to myself to be less distracted and more aware and absorbed in the moments I am existing in. When we are consciously aware of the beauty of life; it isn’t just exciting, it is AMAZING! I am going to use my heightened awareness to my advantage, this feeling of “almost being done” with my adventure. I plan to live my life in this state of mind. It’s not easy because it requires you to engage in mindful thoughts AND actions. It requires you to appreciate the little things and not see 20/20 ONLY in hindsight. This is a reminder to myself of how lucky I am to be where I am. In the future when I look back and read my blog, I will remember this Thursday night at my apartment. Just an ordinary night in Suphan Buri… But I am alive. I am healthy. I am grateful. I am happy to be in my parallel universe. Speaking of hindsight here are some quick highlights from the last month of life in the Land of Smiles. As I said before it’s been awe-inspiring and full of culture, calories and camaraderie! Sport’s Day & Thai Language Day– School wide celebrations that once again proved how much Thai culture loves to CELEBRATE! Bangkok Brunching– I continue to find amazing restaurants in Bangkok. Truly nothing makes me happier than stumbling upon great Western food, especially brunch! Hua Hin Hills Winery– My friends and I took a weekend beach trip to Hua Hin and visited one of the most beautiful winery’s I’ve ever seen! A true GEM to find in Thailand and it filled my wine-o soul with JOY! Traditional Thai wedding– I was invited to my beautiful co-worker’s wedding and got to experience the beautiful traditional Thai ceremony and the HUGE reception (500+ people) with the greatest date around, Miss Jackie! BIG THANKS to Tuke & Pan for having us!